Every business, regardless of its size, needs killer copy to power it. From start-ups to global corporations, from customer-facing copy to internal comms, words can dictate the success or failure of any brand in any market. But in the digital space, where customers and competition are everywhere you look, copy takes on even greater significance. Do you find creating content a drag? Are you confused by all the conflicting advice out there? Got a feeling that your website could be getting better results? The good news is, you don’t need a background in writing to nail this copywriting lark. In fact, I have a bunch of easy, highly-actionable copywriting hacks that you can use to improve your website TODAY. What’s the point in creating a great blog post if no one ever finds it? 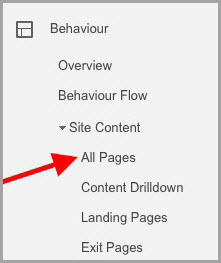 I have an incredibly simple way of optimizing every blog post on your site. It’s really quick to implement and you’ll be able to do it even if you have no previous SEO experience. This strategy revolves around understanding how Google actually works. Nowadays, when Google is working out what results to return after a search, it will analyze all of the copy on a web page, not just the URL, the page title or a handful of keywords. This allows Google to deliver search results that are more accurate and relevant. Suppose you wrote an article on how to write a screenplay. A collection of writing tips, let’s say. Now let’s pretend that someone somewhere in the world searches for ‘copywriting tips’. Is your article a good fit? This might seem obvious, but from Google’s point of view, how do they know whether to show your post in a search result? Writing is writing, isn’t it? The answer is, their algorithm has to be clever. After all, a term like ‘writing’ could mean copywriting, screenwriting, essay writing… you name it. So Google actually looks at all of your content before working out if it’s a good match. That means assessing everything. By looking at all of your content, they can now tell that you’re talking about writing tips of a different kind. And as it transpires, there’s actually something you can do in order to grab Google’s attention – an easy way of showing Google that your content is a good match for any relevant searches. Let’s take that previous example again. You’ve just written an article on how to write for a screenplay. You’re now looking at actual searches that have been made and that are related to your content topic. They are searches that Google has dealt with before and that they think are similar. So why not make use of this data? Why not make life easy for Google? Weave a few of these phrases into your copy. Now, when Google uses semantic search to look for context, your article is metaphorically waving its arm in the air. 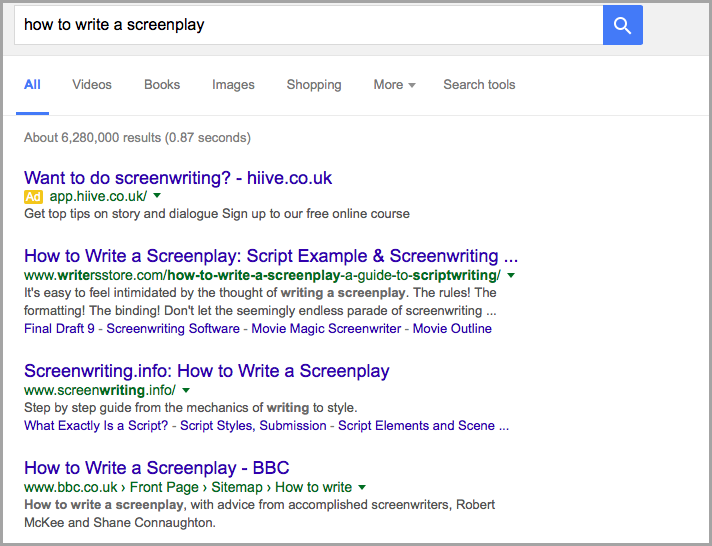 Now, if someone searches for ‘screenwriting tips’ or various derivatives, you’ll convince Google that little bit more. It could make all the difference between being on page one or not. Between getting traffic or not. Between making money or not. Arguably, you should save your best copywriting work for your meta descriptions. Well, it’s basically the last chance you get to convince someone to click on your link as opposed to that of a competitor. You see, you’ve put in the hard yards by creating content. You might also have developed an effective SEO strategy too. But if you stop there, you’re playing a dangerous game. Because being on page one of a Google search only actually matters when it results in a click. 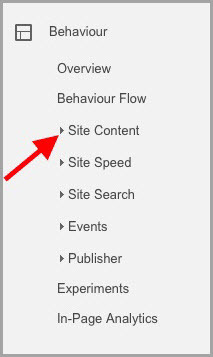 If your on page one of a search and no one is visiting your website, then you’re basically throwing money down the drain. However, a neat little description could make all the difference. It could drive traffic to your site and help you generate more customers. Therefore, head into your CMS and make sure that your meta descriptions have a hook that matters to your target audience. Don’t forget that search engines tend to only display 150-160 characters. Write any more than that and your copy will likely be truncated, putting the effectiveness of your business message at risk. It’s much more user-friendly, isn’t it? And here’s the one we use for the Splash Copywriters website. Note that I’ve even put a phone number in our meta description so that people can contact us without even needing to click on the link. The funny thing about copy is that it doesn’t matter how good it is, if the visuals don’t work, the words won’t either. Great websites have design and copy working in tandem. Often, it’s such a nice user experience that you don’t even notice it. Look how roomy this article feels. Choose a nice, large, readable font. Be careful when wrapping copy around images. Only justify your text to the left. Don’t use too many different colours. And for a quick win, watch out for hanging words. This is where one word of a sentence gets pushed down to a new line. Note that even Copyblogger isn’t perfect. There’s a hanging word in the image above – the word ‘am’ is completely isolated. It might seem like nothing, but it looks sloppy, it’s jarring to the eye and really breaks up the rhythm for the reader. When that happens we have a tendency to skip over the word in question. That could be costly if that last word carries crucial importance – imagine if someone switches off before they truly absorb a price or a particular concept. If we all scan web pages for words and headings that stand out, it’s important to give all our words the best chance of getting seen. 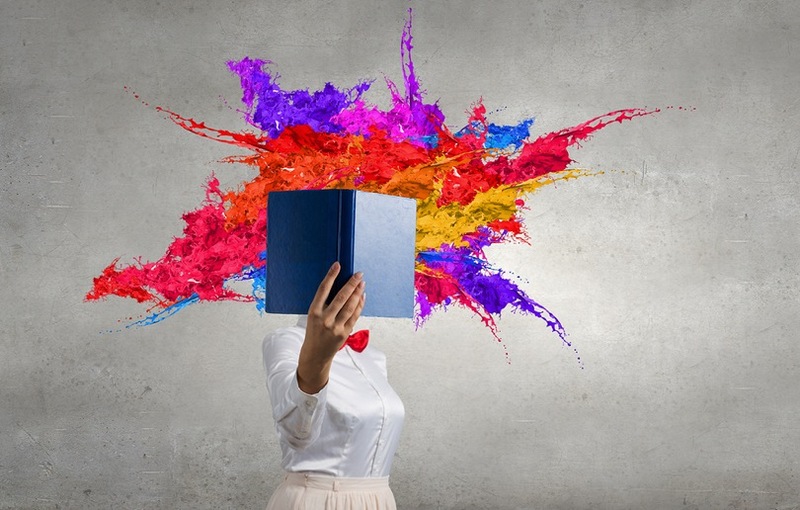 We all know that people only read 20% of words on a web page. What’s more, research tells us that’s pretty much a best-case scenario. Ultimately, the more barriers we put in front of a reader, the less words get read. Time is short and you’ve got plenty to do. I understand that not every one has the capacity to spend ages fine-tuning their business copy. As a compromise, just make sure your copy is spot on for your website pages that get the most action. It’s pretty easy to see the top pages on your website. Your ‘about us’ page is one of the most important pages on your site. This is because, as the old adage goes, people buy from people. Your ‘about us’ page can transform your bottom line if you use it correctly. Use words that will connect with people on an emotional level. Talk about obstacles that you’ve overcome that will be relevant to your target audience. Try and steer clear of empty platitudes. Every company should care about their customers and deliver good service. It should be a given. Think about what’s really important. You might be proud if your company is 100 years old, but really it doesn’t matter to most people. Unless it’s completely inappropriate in your particular niche, use an informal, chatty style. Photos are always good. It’s reassuring to put a face to a name. It shows that you’re not hiding before a keyboard. When writing blog posts, many people have trouble getting started. What angle should you take? Are there any rules to follow? Meanwhile, others get started and structure their posts in a very formulaic way, which doesn’t make for an engaging read. I’ve found that the most entertaining and popular blogs all have a very clear framework. It’s a two-part framework that’s very simple, but really effective as far as engagement is concerned. They usually start by illustrating a problem. This approach immediately forms a bond with the reader. The author is saying that that they know there’s a problem. I really like the use of the word ‘slog’ too, as it conveys a feeling of hardship. It’s nice and subtle, yet the author is inferring that help is on its way. After stating the problem, then it’s time to make the declaration. This is when you should tell the reader that you’re going to help them. No details at this stage, but just some reassuring copy, preferably with some teasers thrown in. I’d prefer it if the copy was a little more direct. In other words, spell it out for the reader a little more and say “I’m going to help you”. But I like the two questions. “What if there were a shortcut” implies there is one. It piques our interest. “Wouldn’t you want to know how” has an obvious answer, but it’s a nice narrative style that’s easy to read and, more importantly, keeps us reading. Understanding what makes people tick is key to getting great results from your copy. This is a huge subject area, so I’d really recommend starting off by watching the video below. In it, speaker Simon Sinek talks about how people don’t “buy the what”. Instead, “they buy the why”. What that means is, if you can link your product or service to an ethos, you’re more likely to enjoy a profitable business. Most bloggers overlook this, but a great SEO copywriting tip is to ensure that your URLs are nice and tidy. When it comes to URLs, it’s best to have them short and relevant. If possible, they should also contain a keyword. The bottom line, once again, is user experience. Can someone quickly scan your URL and know what your post is about? Then that means it’s going to sit well with Google. As humans, we all experience a wide variety of emotions every day, each with a varying degree of intensity. In fact, we’re always feeling something, aren’t we? The key to successful marketing is to identify what emotions are important to your target audience. Create a detailed, accurate profile of your best client. Who are they? What do they like? What do they dislike? Where do they hang out? What sort of content do they like? … what do they want? What is your audience struggling with and how can you help? Building up a picture of both them and their pain points will help you create more impactful copy – the sort of copy that will convince them to take action. Picking the right keyword to focus on will prevent you from wasting a huge amount of time, effort and money. There is a big difference between selecting a keyword that generates a lot of searches, and choosing a keyword that will actually help increase your revenue. Let’s assume you run a digital marketing business. Consider the term ‘internet marketing’. As you can see, it gets a lot of searches – 1,900 per month, to be precise. You would think that if you ranked on page one for ‘internet marketing’ then your phone would be ringing off the hook with customers. Because when you analyze the situation and delve a little deeper, someone searching for ‘internet marketing’ could be looking for free advice. Now this term might only get 170 searches every month, but you can be much more confident that a user is interested in engaging with a business that specialises in internet marketing. Don’t forget that if someone visits your website, then it’s normally for a reason. You can create the best content and generate huge amounts of traffic, but unless those visitors are doing something when they’re on your website then it’s all kind of pointless. Your copy must take someone on a journey. For instance, let’s consider blog posts. As we know, visitors to your website will only read 20% of the copy on a web page. So therefore, if someone does reach the end of one of your blog posts, you need to have a compelling call-to-action. You need to benefit from their presence in some way. We’re not talking about revenue here necessarily, but perhaps an email sign-up, a download or some sort of consultation. Regardless, have some sort of objective. And be precise. In summary, start incorporating some of these 11 copywriting tactics today and you’ll start improving your business. Why not check out the free, comprehensive copywriting checklist attached to my recent blog post. It contains the 21 copywriting techniques that I use each and every time I create some content. This article was written by Matt Press from Business2Community and was legally licensed through the NewsCred publisher network.